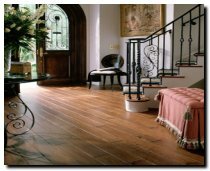 The Virginia Vintage™ Hand-Scraped Collections consist of beautiful hand-selected, handscraped hardwood floors. Now available in both an engineered ½" thick x 5" wide, or a solid ¾" thick x 5" wide plank, these floors bring timeless beauty, traditional craftsmanship, and enduring quality into your home . Available in random lengths with pillowed edges and ends and tongue-and-groove milling, its Duratina® low-lustre aluminum oxide finish is guaranteed for 25 years. Available in many species and colors, Virginia Vintage™ Hand-Scraped Plank adds character and value to any home. Don't see the Virginia Vintage product your looking for? Call 407-925-0917 for DIRECT PRICING!! !